What’s the advantage of buying vanilla extract and vanilla beans in bulk? 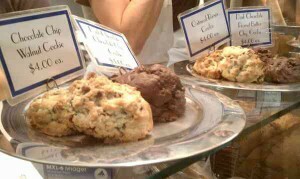 For a flavor that everyone loves (some people love it more than chocolate! 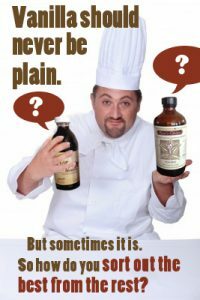 ), why is vanilla extract sold in little bottles or one or two bean tubes? Seems counter-intuitive, doesn’t it? Then again, vanilla beans are so expensive, why would I want to buy them in bulk? Good questions that we don’t usually consider when we’re buying spices and flavors. Nearly all are sold in small quantities except online and in specialty stores. We’re essentially programmed to think small even though it’s all about big flavor. While it does make sense to purchase dried herbs in small amounts unless we’re using them daily, when it comes to vanilla beans, it makes more practical sense to buy in bulk. Here are five good reasons why. A two-ounce bottle of a nationally known brand vanilla extract costs $7.95 or more in the supermarket. The packaging is designed to make the bottle appear larger, but it’s still two ounces. It’s also really mediocre, and it’s made from cheap beans from any of several different countries. A four-ounce bottle of Rain’s Choice Madagascar vanilla extract, which has been made from ethically-sourced beans, costs about $11.95 in the market. For four dollars more, you get two more ounces and it’s far better quality. 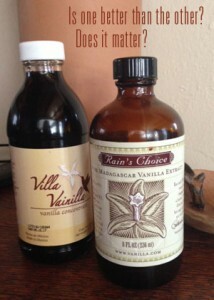 However, you can currently purchase a quart of Rain’s Choice vanilla extract for $30.00. This is the same as 16 two-ounce bottles except that those 16 bottles would cost $127.20. Said another way, you can pay $4 per oz or $.94 per oz in bulk. Which makes more sense (or “cents,” if you will)? The same is true with vanilla beans. Two beans in a tube in the supermarket cost roughly $7.95. They may be from Madagascar or they may be from Papua New Guinea, where vanilla beans are significantly cheaper. A half-pound of our Madagascar beans usually contains between 50 – 60 beans, depending on their size. They’re far plumper, moister and more flexible as they haven’t been exposed to the dry air and bright light of the market. A half pound of our vanilla beans currently costs $52.00, whereas 50 supermarket beans purchased in two- bean packs would cost nearly $200! Which makes more “cents”? Why is there such a huge price difference when buying vanilla in bulk? Packaging! It’s one of the big costs in bringing products to market. Professionally printed labels are expensive. Glass is both expensive and heavy to ship. Because glass breaks, it requires more packaging to ship it safely. Ka-ching, ka-ching! This leads to us to the second good reason to buy in bulk. It’s green to buy our food in bulk. Buying local whenever possible is the way to go, which is why farmers markets are so great. However, unless you live in the tropics, bananas, sugar, pineapples, chocolate, coffee and vanilla beans are out of the question. And while I support locavores whole-heartedly, I’m not ready to sign on the line to eat only from a 100 mile radius. When it comes to vanilla, it keeps well. Keep the beans in heavy plastic or a jar and store in a cool, dark place (but not the refrigerator or freezer). Because extracts are high in alcohol, they actually mellow with age. A quart of extract will last well for more than a year. Again, store extracts in a cool, dark cupboard. If your kitchen gets steamy-hot, then put the extract in a closet where it’s cooler. Extract does best in areas that remain between 50 and 80 degrees F.
How many times have you decided to bake on the spur of the moment only to find you’re missing a key ingredient? Buy in bulk, check your pantry periodically, and you’ve saved both time and money. 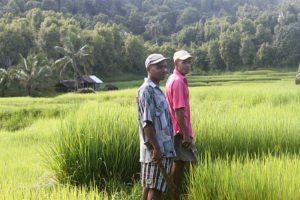 Whether you pick up vanilla beans directly from farmers while on a vacation in the tropics or search for ethically traded vanilla in a specialty food store or online, you’re supporting the farmers. Why does this matter? Think about the volume of immigrants flooding into the US or Europe. The vast majority aren’t leaving their countries because they want to. They leave because they can’t support their families or themselves on minimal wages. A Guatemalan coffee farmer I know came to the US because they were getting less than 50 cents a pound for quality Arabica coffee beans. Like vanilla and chocolate, coffee is a labor-intensive crop. 50 cents a pound for the farmer — $2.50 – $3.50 a cup for the consumer? Something’s wrong with that picture. In the case of this farmer, all he wanted was to return to his finca in the mountains. Instead, he worked seven days a week doing yard work. That’s why it matters. Every year I give vanilla as gifts to my friends. Not just because I happen to sell it, but because it’s such a great gift. Whether you buy beans to make your own extracts or liqueurs, or bundle some vanilla beans and tie them with raffia, you will please anyone who loves the flavor and aroma of vanilla. Even better, it’s a pretty inexpensive gift. We also have customers who buy extracts, paste or freshly ground vanilla bean powder and split the order with friends. 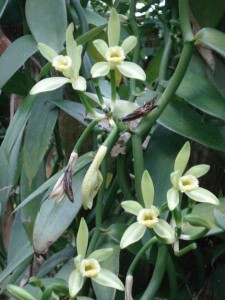 When buying vanilla in bulk, you’re guaranteed premium-quality products at a fraction of the cost of the market price. Ready to save yourself some money and some time, get better flavor, and assure vanilla farmers get a fair price? There’s no reason to be intimidated by purchasing a pint, a quart or even a gallon of bulk vanilla extract or a pound or more of bulk vanilla beans. They will last, save you time and money, and be ready when you need it! And farmers won’t be tempted to move north to take menial work in order to survive. Is Fair Trade vanilla really fair? What’s the best vanilla extract? or farmer or writer. But I care. That’s what I say on FB. I just found your website when I searched online for ‘how to store vanilla beans’. I’m so grateful I found your site, because I was about to purchase beans from another source, which is not a ‘fair trade’ company. I feel much better about your company. Also, you have bottles to store the beans in! Thank you for having a conscience, and caring about the farmers and laborers. We have exploited enough people! Thanks so much for your note and vote of confidence, Virginia. If our small spaceship circling the sun is going to survive long term, we MUST learn to be better stewards for our environment and those who are traveling with us. What I do is very small, but small steps every day add up. I’ve been really moved by how many people do care and are doing what they can to make our planet a better place. And, after spending time in Africa this last year, I was yet again really shocked at the after effects of colonialism. A lot of healing work needs to be done. Little by little….